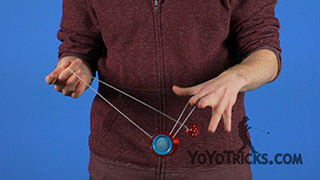 Learn how to do basic arm and wrist rebounds for Freehand yoyo play. So you start in an Electric Fan, and then you do two arm rebounds and two wrist rebounds. 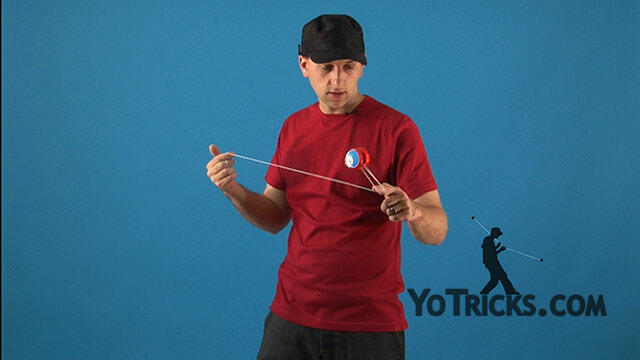 Arm and wrist rebounds are really the most frequent type of rebounds that you are going to see in 5A tricks, so it’s really important to master this. 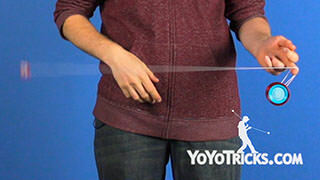 Before we actually teach this trick first we have to go over the proper technique for rebounds. When you are watching your favorite 5A player do tricks, it might look like he’s just smacking himself with the counterweight to make it change direction, but that is actually not right. 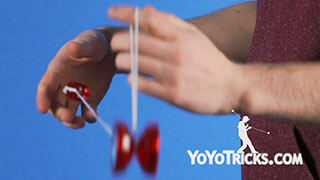 If you just smack yourself with the counterweight you are not going to have as much control, and it is going to hurt. With proper technique you will have more control and it should not hurt. 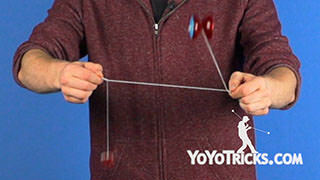 To do it properly, what you are going to do is swing the counterweight and instead of just smacking yourself you are actually going to wrap the counterweight around a little bit and then right after the counterweight hits you are going to pull off with the hand that is controlling the counterweight and then let it come around. When you pull off it keeps the counterweight in line and you have much more control. Whether I am doing arm rebounds I wrap around and then pull off, or if I am doing wrist rebounds it is wrap around and pull off. Leg rebounds same exact thing, wrap around and then I pull off, whatever part of your body, you have to wrap around and then pull off. So, now that I’ve drilled that into your head we are ready to learn the actual trick. 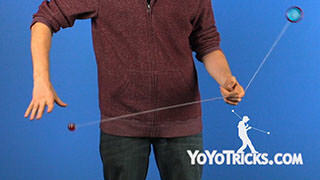 So first you are going to want to start in an E-Fan like we taught in our E-Fan Combos video. Once you are here with the counterweight spinning, what you are going to want to do is take your throwhand elbow, and point it straight forward and turn your throwhand so that your palm faces you. 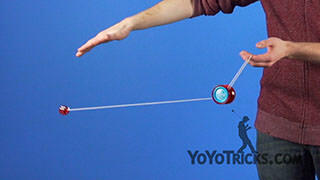 The counterweight is going to swing over and land on top of your arm. You’ll see that right here the counterweight is resting over my arm, I didn’t just smack my arm. 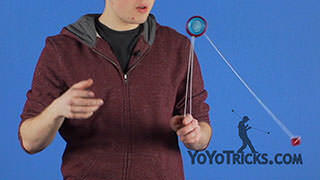 If you’re having a hard time getting the counterweight over you can just try increasing the size of the E-Fan and give yourself a little bit more string right there. Once the counterweight is resting over your arm what you want to do is you want to bring your throwhand really close to that shoulder. This aligns everything better and it makes things a little bit easier. You are going to want to swing your throwhand down like you are swinging a hammer. You want to swing the counterweight in front of this trapeze. Swing my hand down and the counterweight comes under my arm and rests on top. See that I pull my arm almost all the way into my armpit. 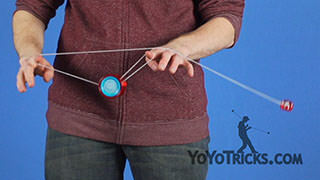 That is just to give the counterweight string as much length as possible so that is can come all the way around. 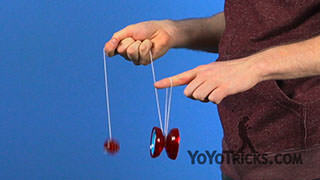 Once I am here, I am going to pull my hand up and out and drop my elbow so that I pull back into a standard E-Fan. From here we are going to move into the wrist rebounds. 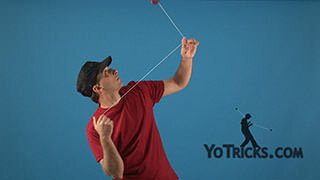 When you are doing these it is really important to keep your throwhand above the yoyo because if you do not, the trapeze is going to fall right out of the yoyo. 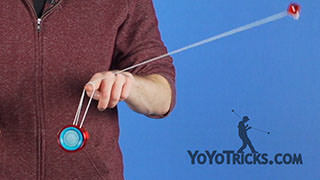 First, for the wrist rebound, you’re going to wrap the counterweight under and when you are doing this you are going to turn your palm so it faces straight up, and point your thumb so it faces your opposite hand. 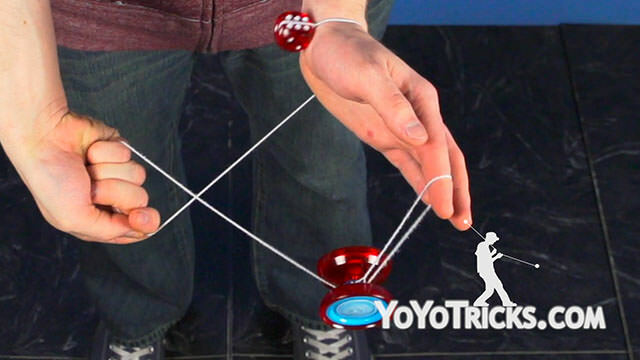 I’m going to curl my hand under and let it go around my wrist, and right after the counterweight makes contact I am going to pull off and swing the counterweight over my wrist onto the opposite side. Right after it hits my skin I am going to pull off back into a standard E-Fan. 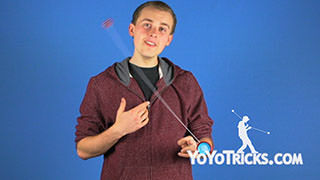 After you have mastered the basic rebounds and you are ready to add a little more challenge to the trick, or you just want to make this trick look a little bit more impressive, you can start adding yoyo motions while you are doing the rebounds. 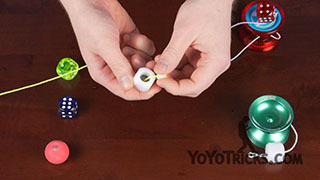 If you learned our last E-Fan video and you remember the yoyo motions from that you can add those while doing this trick. So you can do Double-On Trapeze, Double-On Undermount, and then you can add Eli Hops while you are doing the wrist rebounds. 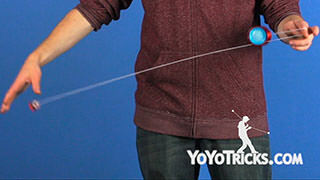 That just makes this trick look a little bit more impressive. And that is the Introduction to Rebounds.